The Duke and Duchess of Cambridge, styled as the Earl and Countess of Strathearn in Scotland made their first official visit to Dundee today. Ahead of the visit a Kensington Palace spokesperson said: "The Duke and Duchess of Cambridge are delighted to be visiting Dundee on Friday. 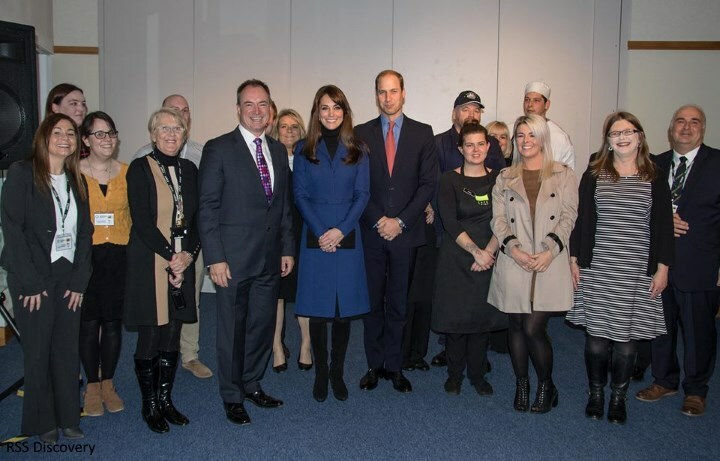 Their Royal Highnesses, who first met while at the nearby University of St Andrews, are very much looking forward to returning to the region and having the opportunity to meet people from the city." 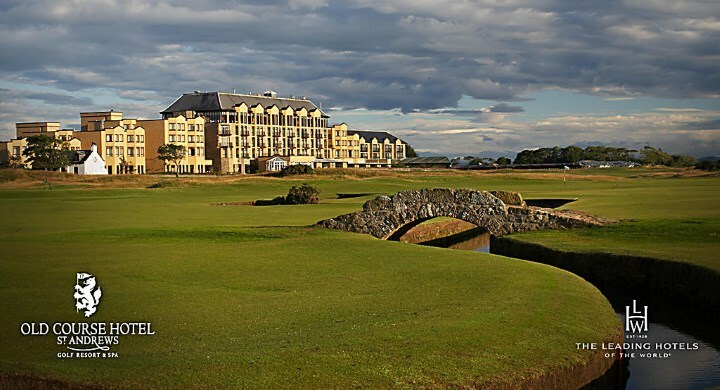 The couple spent last night at the Old Course Hotel in St. Andrews. No doubt a chance to recall happy memories from the early years of their courtship. The couple had the opportunity to meet locals during a walkabout. 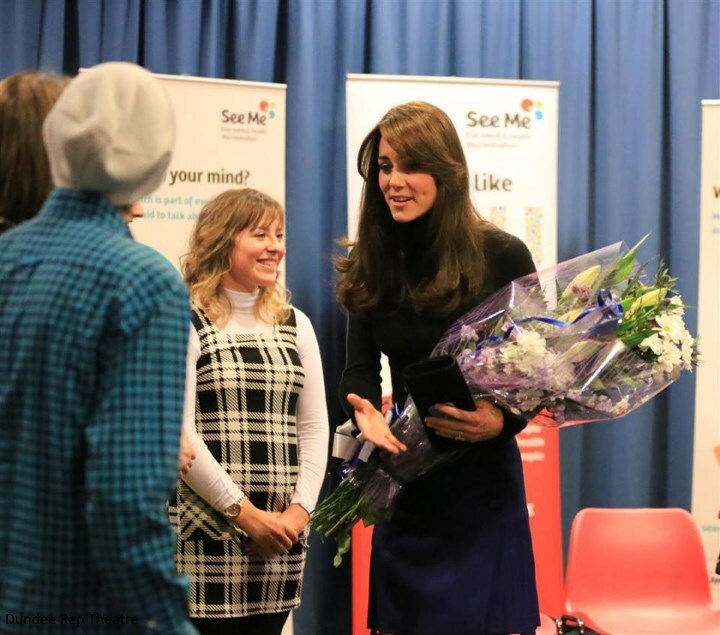 Kate told a group of students she was a regular visitor to Dundee during her time at St Andrews "I have very fond memories of coming to Dundee when I was a student". The couple also revealed they tried Scottish dancing at university but admitted they "weren't very good at it". 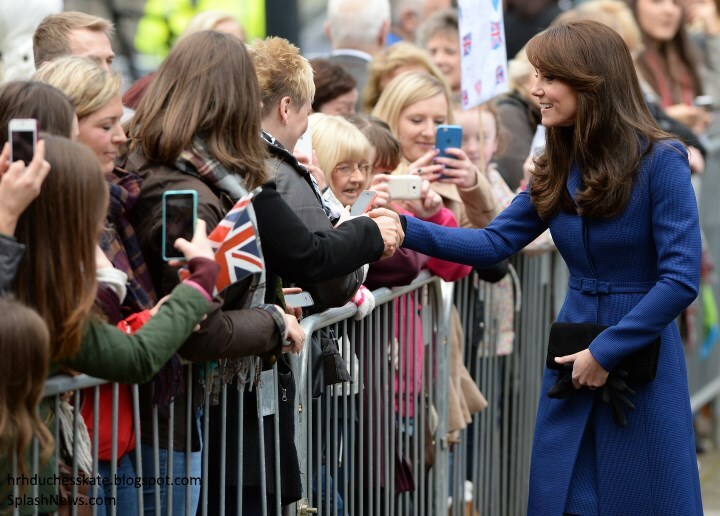 There was a large turnout from members of the public who were eager to meet the royals. Whilst chatting talk turned to Kate's thoughts on William's motorbike. More from Press Association reporter Nick Ward. It's been a busy week for the couple who played a formal role in a state visit for the first time - attending the state banquet on Tuesday and a creative industry event on Wednesday. Afterwards they hosted a private reception for members of the media. Kate received Dr Nicholas Cullinan upon assuming his appointment as director of her patronage the National Portrait Gallery. The Duchess also received the former chief executive of Action on Addiction, Nick Barton, and his successor Graham Beech. The day kicked off with a visit to Dundee Repertory Theatre where the couple met families participating in one of the theatre's popular Family Fun Day programmes. They met the cast and crew of 'In Her Shadows', a visual performance that explores a young woman's relationship with the complexity of her depression whilst challenging the stigmas that surround it. 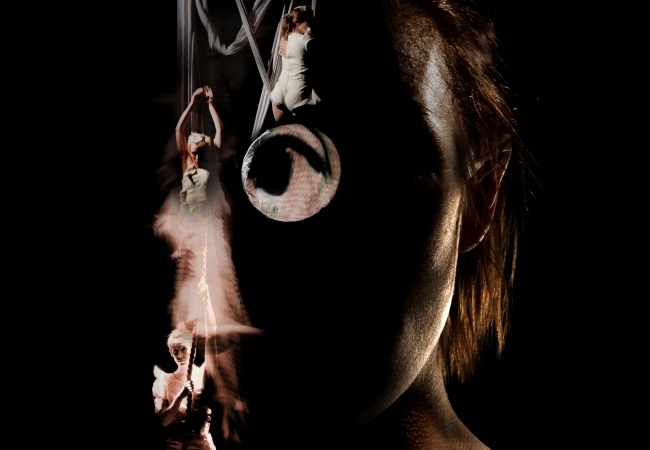 The dance-mindscape features aerial and physical theatre which is supported by stunning projections and haunting music. Two female performers tell the story of a young woman called Amy. After being overseas for years, she returns home to Scotland to find a new place to settle down in. With the unexpected rejection from her mum, Amy is tested, pushed and thrown into her own mental turmoil. 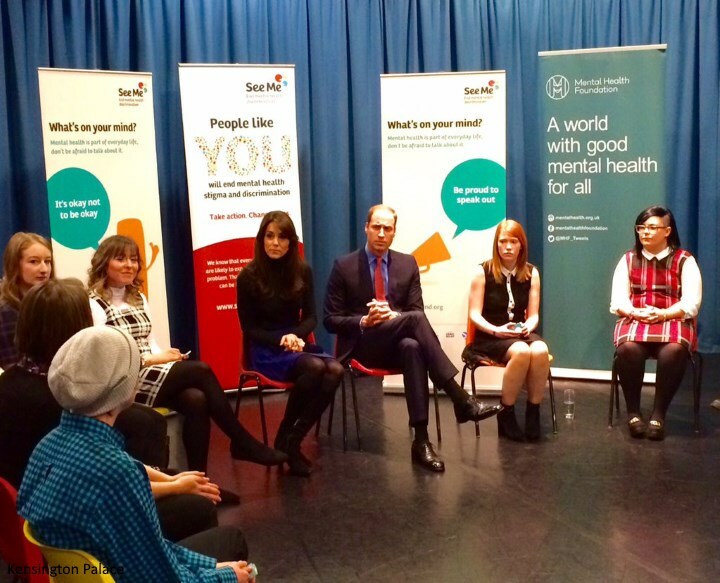 The Earl and Countess will meet young people participating in a workshop with See Me, a group working to end mental health discrimination in Scotland. Next, Their Royal Highnesses visited The Corner and participated in an anti-bullying workshop. The Corner, offers a range of physical and mental health services for young people, many of them peer-led. Support, advice and help is offered in a range of areas including mental and sexual health, drugs, smoking, alcohol and exam stress. It is an invaluable resource for young people who can share their concerns in a confidential space. The couple had the opportunity to take in a little sightseeing as they are given a tour of one of the best-known landmarks in Dundee: the RRS Discovery. 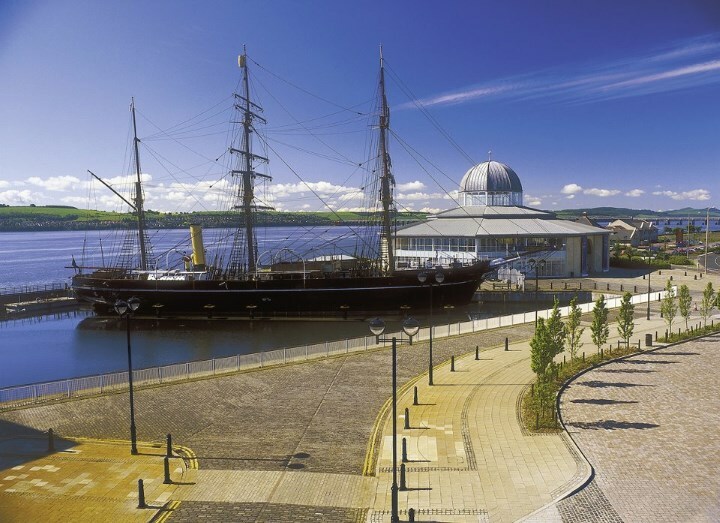 It is described as the ultimate day out with visitors given the chance to "climb aboard Captain Scott's ship RRS Discovery where you will follow in the footsteps of him and his crew, see how they lived, what they ate and witness their hardships and their triumphs. It's a fascinating tale of one of the most heroic voyages of exploration ever undertaken". 'The RRS Discovery sits in a dry dock on the Waterfront right next to the site of the planned V&A museum. It offers a glimpse of the city’s past alongside its future. A great shot of William and Kate. They met with staff and crew members. Their Royal Highnesses posed with staff before leaving. 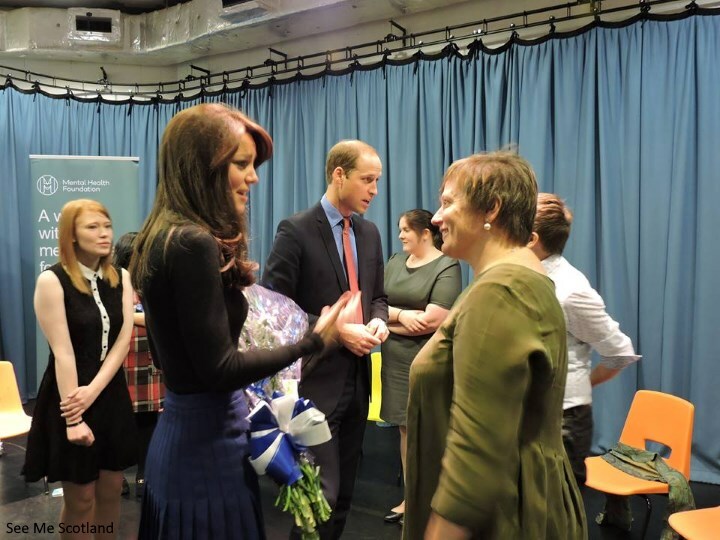 Finally, the Earl and Countess visited Abertay University where they will met students involved in BAFTA's Young Game Designers Programme. William is president of BAFTA and their deputy communications secretary Nick Loughran told the Evening Telegraph the invite the couple received to Abertay University was "happily accepted" and the couple then decided to take the opportunity to see more of Dundee, before adding: "Supporting the mental wellbeing of young people is a major priority." 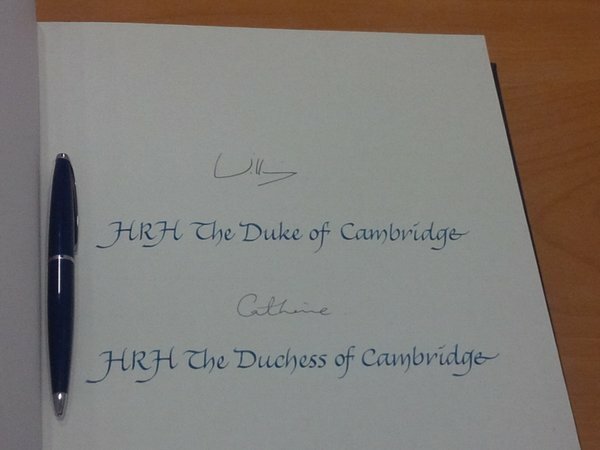 William and Kate signed their names. Kate chose a bespoke slim fitted dogtooth wool tailored coat and mini dogtooth wool kilt by Scottish designer Christopher Kane. The blue belted coat is a striking colour and impeccably tailored. We've seen Kate opt for Mr. Kane's designs several times now. 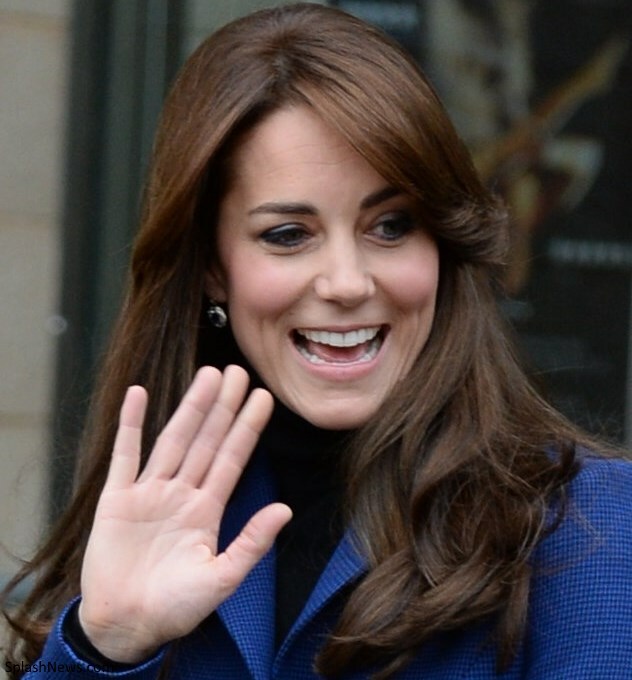 The coat is very much a 'classically Kate piece'. Kate wore a black turtleneck with her kilt. A better look at the kilt. 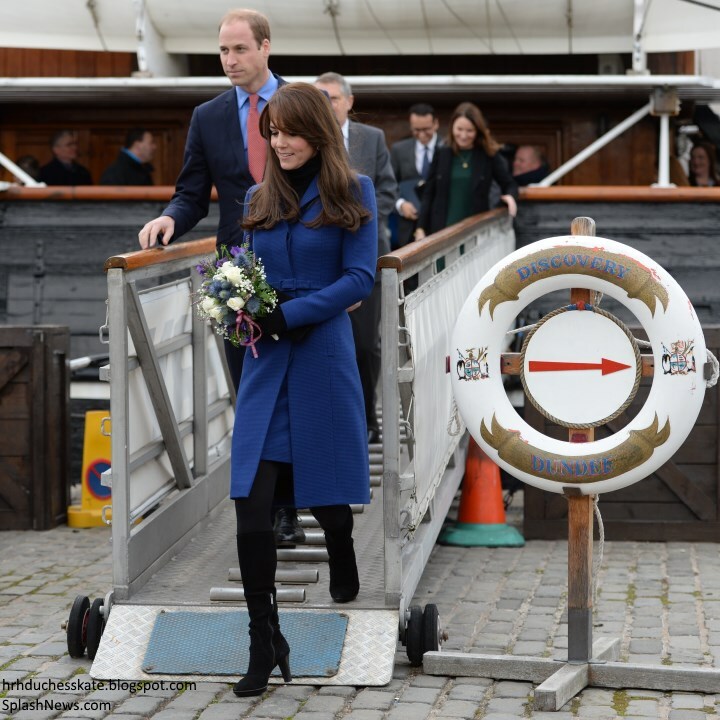 Kate sported her Aquatalia Rhumba Boots. As we recently mentioned the weatherproof boots have been discontinued, however there are still very limited sizes available at Neiman Marcus Last Call and Lord and Taylor. The Aquatalia Damara Boots are the updated version of the Rhumba - retailing for $725 at Nordstrom. The Countess carried her black suede Muse clutch and gloves. Kate accessorised with her sapphire and diamond drops. You can view a video from the walkabout at YouTube. First of all, I love the mental health focus. So important! Also, how sweet that they stayed the night in St Andrews :) Probably many fond memories!! On the look. I LOVE it! The coat is so pretty. Tailored and streamlined with a little hint of "umph" with the small pattern! Very, very pretty!! Rebecca, thank you for saying my thoughts exactly.....since I'm running off to work ! Love this outfit. I love kilts and happy to see Catherine wearing a bit younger sassier outfit under the coat. I am a huge fan of turtlenecks and kilts. The blue is great, I would have loved even more if the coat could have been solid the skirt a great plaid in homage to her and Wililam's titles, but I am big on that type of stuff:) Well maybe I have spoken to soon, is the blue check in homage to anything? Kate looked beautiful in this outfit. She looked like a mannequin doll without the coat/ nicely slim. Love the coat!! But- anyone else sick of these boots? They are a good look, don't get me wrong but she wears them so much. Maybe it's time (like with her sporting uniform) to change it up a bit? Yes, those were my thoughts exactly, word for word! Nah, they're basic and unnassuming enough to be a good base shoe. They look warm and comfortable! I agree. They are basic unnassuming boots. Aquatalia strives to combine fashion and comfort. I am sure between all the walking and standing on her feet, that she would want to be in the best comfortable shoes. Barbara, I replied to your comment in the previous post but it was lost to the great unknown. I just wanted to say that I loved seeing the D&G for the same reasons. The dress was so outside the box for Kate and I hope to see her experiment even more. I think she plays it safe too often and would enjoy seeing her enjoy the fashion spectrum of her job more often. Did you see Paola's comment on this blog entry? She may have found a symbolic link to the flower of the lace on that dress. I think it makes the choice even more wonderful. They are a great fashion staple especially for colder weather. 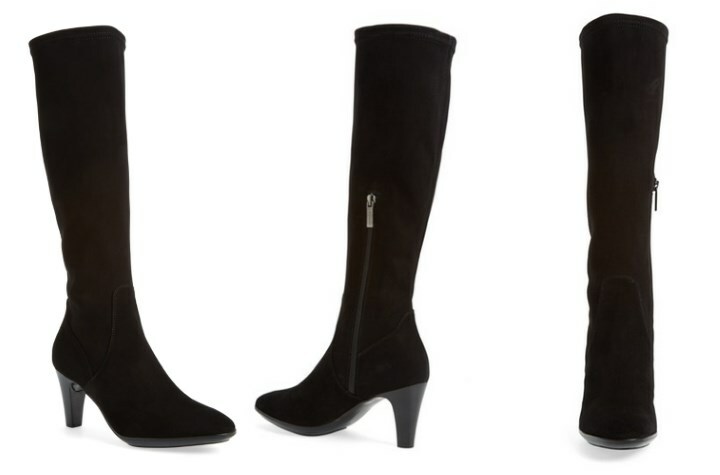 They keep you warm and toasting and a heeled boot is a great way to keep it dressy. I am sure comfort is a big consideration when you have to be on your feet a lot. I agree. Great coat, skirt, shirt---love the blue color as it's very striking, but yeah, sort of tired of the same boots although they work well. She tends to be a creature of habit, but she really is always impeccably dressed and so pretty. Also, don't you have a really great pair of boots that you wear again and again? Of course she's not the average person but just because she could wear new shoes/ clothes all the time doesn't mean that she should. I think the outfit is lovely, but you can certainly find a pair of boots that are a bit more formal looking than these. I think it's the suede and side zip. I have a couple of pairs of basic leather boots with a heel about that height that slip on and off and are a bit more polished looking. They're also waterproof and have a non-slip sole. So you don't have to be casual to be prepared for the weather! I also have some really snappy ones, one of which would have been awesome with this outfit! I hear you bluehare. But like all of us, she may just love the fit and feel of these shoes. If she is wearing them out of pure love or comfort and not wanting to shell out for a new pair that may end up being not so comfy then I say YEAH to her, I would do the same. She is very beautiful and her whole outfit is very nice. She must love suede because she accessorize most of her outfits with suede shoes and bags! My opinion is that for todays outfit suede boots are appropriate but suede does not look nice with lace. The beautiful plum lace dress she wore, needed a finer material than suede in her shoes and bag. She looks beautiful. Thank you Charlotte for all your hard work this week!! Great look for Kate. Very sleek and well put together. She always look great in blue. I'm Obsessed with This Look! The Fabric; The Style; The Fit! I Truly Think it's One of My New Favs! Becca, I share your enthusiasm for this outfit. I too love everything about it. Color, cut, fabric, pattern, the black turtleneck and accessories...every detail. She looked great...and so happy! Lovely to see. Me, too! I'm loving this look, with and without the coat. Beautiful color on her. And I love that it's a kind of plaid. Love the new coat and how exciting that Kate is wearing a kilt underneath from the same designer! I would LOVE to see it without the coat :-). The color is stunning. I think it is fantastic that William and Kate is concentrating on the theme of mental health throughout the summer, really putting it out there for people to take note :-). Kate looks beautiful! Her hair looks amazing, so glossy and shiny and I absolutely love her coat! She took her coat off inside! Yes! I always thought it weird she didn't do that before and it seemed to emphasize hoe quick her engagements were. Taking off the coat makes her seem human! I wish they would go on continuing to support this and similar causes!! Very useful one!! On fashion note: the girl has been shopping a lot lately. I am totally in love with the coat, and finally she changed it up the coat+dress combo. She looks chic and happy. Hi Charlotte, I wrote a comment to your former post but it vanished in the Internet's large sea; it was about Kate's lace. I think it represents peonies, the national flower of China; the meaning of the blossoming flower is peace. Isn't it beautiful? Thanks for doing the research Paola! It is beautiful and makes all the sense in the world. It's beautiful and is quite likely one of the reasons she chose the dress. Thank you for researching Paola. I have Such Respect for How Much Detail & Care & Who knows how much effort, Kate Puts Into Her Sartorial Choices! Sometimes it kinda blows me away! :) I think it says a lot about Who She Is as a Person, To Put In That Much Care! Much more than..... Hey nice dress, fits well, I'll take it? I agree that she saw Chinese symbolism- possibly peonies in the dress and it does look like peonies. Also I think Mandame Peng had a silk dress under her coat - so the two ladies may have been dressed with similiar formality. I love the D and G dress on Kate. Since the Chinese are said to be status and brand conscious - this is one place I would have preferred a British brand - possibly even a status British brand that is in China (Burberry? Don't ask me.) That was a miss to me. I normally don't mind when Kate branches out - I even enjoy it - but this was an exception. That is unbelievable for an ancient country and culture. One would assume they value heritage. I think they should also understand and value other people's culture. In general what is inherited from the preceding generation is highly treasured in many cultures. The most exciting tiara for Kate will be the one William will design and gift her. Great post Charlotte - thanks again for all your hard work. I really enjoy the coverage you provide on each occasion, it's always comprehensive and interesting. As one of your male readers - and I'm not sure how many men read this blog too? - I love this page and always check in to see whats happening (and fascinated by the range of opinions and comments from the other bloggers). This look is elegant and classic, strong colour and beautifully tailored which really is becoming a signature for Catherine - although I agree she could mix up the boots and simple black polo up a bit now and again. Christopher Kane, the designer has some really interesting pieces and I hope to see her wear some more of his collections/bespoke pieces in the future. Great focus on the mental health in the last few months which is really starting to hit home and make some impact in the awareness surrounding the subject. omg finally another man. Chalotte i have been reading your blog since May 2011 and I am proud to say i was one of your first regular readers. Its really fascinating how much the blog has grown. I quiet remember when there were just less than 20 comments and now you get hundreds .Very proud of you indeed. I am really sorry for never having made a comment before as i choose to just lay back and read others. (i guess it also had to do with the fact that i thought i was the only guy here. Keep up the good work. Welcome fellas! So glad you all decided to add a comment to the blog. It is great to know that you are out there as well. Keep commenting, your opinions are much appreciated and needed in the comments too! Hello and welcome to the comments section of the blog. I know I speak for all of us here when I say we would love to hear your thoughts more often! We do have a group of lovely ladies commenting here, however, I do hear from male readers who describe themselves as 'lurkers' and feel a tad apprehensive about commenting so it's great to hear from you. Hi guys!! I suspected that there have been male readers on this blog but so nice to have that confirmed. Thrilled to have a male perspective on Kate. Makes things more interesting, I think. Gosh, it´s great to hear from you, guys!! Please, by all means, don´t be shy and let us know your input! I´m VERY sure it would be great fun and certainly interesting to see all (or at least some) of "our" discussions from your (maybe very similar, maybe sometimes very different, who knows?) point of view! I have been a reader of this blog may be since 2012. I started posing about a year ago. I did not notice until recently, most likely only women post, when I read commenters addressing people as “ladies”. There are so many Anonymous on this blog; it is not easy to conclude all are ladies. Some of the best information and posts I have read are posted by Anonymous. It will be wonderful to know the perspective and opinion on everything from the other half of the world/the men of all ages, heritage and every diversity. Regarding style, some of the best designers are men; if they also post, they will contribute to that area of this blog. Other men are in every field; society is formed in combination of men and women obviously and why not here. They should absolutely post. Ok go Co-post/blog! / as in Co-ed? They are supporting a great cause & I am loving that they wear the same color- William's shirt, Catherine's coat etc. Last post was the dress & tie (I think) in similar colors. Thank you Charlotte, for your amazing work. Happy & safe week-end everyone. Now that I think about it, while I do like it when William matches Kate's color (the lace dress yesterday and his tie), I think it's time for a change for William too. Just different ties would be enough--they are so blah and I think he's got several of the same suit and all one color: blue. While he's not a fashion plate, something interesting would work and be a nice change. He's stuck in his familiar work- uniform too. Would love to see a floral tie or something a bit different. Why not a plaid tie when in Scotland? really? only 2 ties? how is that even possible? makes "what to wear today?" an easy decision I guess. Yeah, I know :P I was being funny! (Or so I thought!!) But I would LOVE if he branched out some more in fashion!! :) He's a handsome man, it could show in his clothes! Francis, looking back through the Dream Look entries, I see that you predicted the jewel choices for the state banquet pretty accurately. No one could have expected the bracelet rather than the necklace, but you realized the loan could be personal jewelry other than a tiara. It's also interesting that those of us who chose lace gowns foreshadowed the Friday event, and Sofy even came close to the color. I have a feeling that the contest in general may have had its influence, though I don't believe anyone thought to include peonies! I love this color but prefer the coat from rugby match. 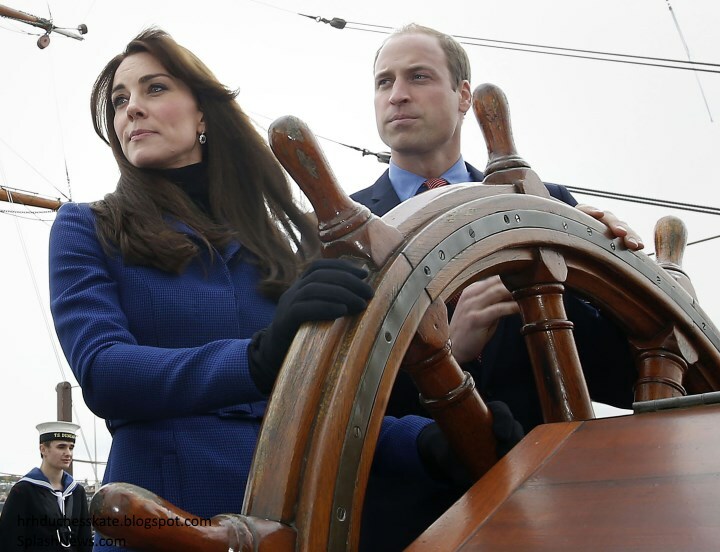 I can be mistaken but Kate's face looks taut. Does she use botox? Has she ever expressed her opinion on aesthetic medicine? She looks very nice and the whole outfit is very nice too. I think she looks a little bit tired under the eyes but i guess their vacation in Mystice must be coming soon so she will get all the rest she wants in the perfect place! Yes me too i think she seems tired :/ great journey in moustic but we have to know she's in public since few weeks. She had had time to rest..
Good to see them in my home town of Dundee! I grew up doing community theatre at the Rep - they do such amazing community outreach work. And the Corner was really a great drop-in center for young people with worries /concerns etc. How lovely!! Kate looks fabulous, and I love the pattern in the fabric - it takes a simple coat up a notch in my book. Also love that she chose a skirt and top, rather than a dress. Blue is such a beautiful color on her. Love this outfit and really have loved everything she's worn all week. Although I like she re-wears outfits, it's always nice to see new pieces. I'd love to know how Kate (and her assistants?) manage her wardrobe. Like when to get rid of things, how it's organized, etc. That's a great question about wardrobe management. I have often wondered that myself. I imagine that some pieces she has worn are tucked away into the archives to bring back in future art shows as well. Wouldn't that be fascinating to find out the behind the scenes of her closet! I agree Rebecca. Kate must have a storage room of archived outfits at KP. If not, then her wardrobe myst be HUGE and I'm jealous...there never seems to be enough room in mine! The royals do seem to save everything. I wouldn't be surprised if they are saving Kate's "retired" outfits also. Couldn't have said it better Sharyn. A lot of her outfits will eventually be archived for posterity given her role in the RF. This has probably already happened to her wedding dress, shoes etc. This article talks about the Queen's clothes & says they're all archived for posterity at BP in boxes & cotton bags inside mahogany wardrobes with airtight doors. So it's likely that a similar system has been set up at KP for Kate. The RF have access to the best expertise available on conserving textiles through institutions like the V&A, British Museum, Royal School of Needlework etc. It's a lovely fantasy to imagine having access to these wardrobes! I admit, I have spent time daydreaming about what her wardrobe and closet must be like and how they organize it and store stuff and where she meets with designers, etc. That would make a nice documentary I think. They have dressers or valets, and each outfit it stored indicating when it was last worn. I would be willing to be that the historically significant stuff is archived by someone charged with that. What a job. Royal Clothing Archiver. I think that might be a dream job for me! I have always wondered how and where Royal wardrobes were kept and the whole process of it all. Can you imagine the closets at the palaces?!?! Do they organize by color, season, etc? How are the shoes, hats, and handbags stored? It's all so interesting to me. I've seen the Fashion Rules exhibition currently at Kensington Palace three times and am so impressed at how pristine the dresses still look. On display are dresses from the 1950's to 1980's and they all look incredible. Anon 23:26, in the televised program Charles and Diana: In Private, In Public, she meets with David and Elizabeth Emanuel in her sitting room at KP to discuss designs and fabrics for an upcoming foreign tour. Seemed fun and informal as everything was spread out on the floor for Diana to look at. It would be a fun documentary on dressing the Royals and how it all is kept/stored after they wear it. Bluhare, wouldn't the Royal Clothing Archiver be a fabulous job?!?! HA! Thanks for the link Blue Wren. I think she looks positively stunning, I love that she's wearing a Scottish designer and I agree that the color and tailoring of the coat are just terrific, gorgeous fabric too. I agree something seems off about the boots (truly nitpicking here) - You ladies would know better than I, have they just seen better days? Are they too "heavy" for this outfit? Also, interesting tweet by royal correspondent Richard Palmer, who took a moment to show and acknowledge the hardworking royal photographers, saying "The world's greatest royal photographers, at work filing pictures." This seemed quite deliberate to me given the KP meeting :) Most of these photographers have expressed a lot of frustration lately, they feel they're following the rules but keep getting lumped in with those who don't. By their own admission they've either been barred outright from covering certain events or their applications have been rejected for some bizarre reason. Some of the best photos of Kate - and William - come from these guys, and face it, none of this would exist without them, not the blogs, the magazines, the newspaper covers. Maybe Charlotte could show Richard's tweet on this post so you can all see it and them? I'm hoping the KP meeting straightened some of that out, we'll see. But back to the day, lovely to see them in Scotland, looks like a good turnout and they both look so well. Hi Claudia :) Technology isn't working for me right now either. I replied to you on the last post but its not there, so here I am. I just wanted to say that I agree that life would be oh so boring if we all had the same opinions and ideas all of the time. I usually don't say anything but I have been getting frustrated with the either/ or mentality that gets going around here at times. It seems things tend to go from one extreme or to the other without much consideration for what comes in between. Glad you got what I was trying to say! Our duchess looks great here, doesn't she. I too think these boots have seen better days. They seem to be bagging around the ankles more than usual. I think a longer coat or a boot higher in the leg would look better. Maybe we are seeing to much knee and it is breaking up the line of the coat? I know I would love to see her wear a more stiletto heeled boot but that would be hell on a day like this with all the standing and walking. I suspect the Rhumbas are super comfy. buy new boots? No one would have to ask meeee twice. :) I would like to see her have the fun of more boots, styles, bling also. I would love to see what William gave Kate for the births of G&C, if he got her anything also. And a current photo of Princess Charlotte. There is a formal reception room at KP Apt 1a. It's where Harry met Mrs Obama, Wills had the England women World Cup over, etc. I don't think their staff's offices are within 1A but I different section of the palace. Not enough length on the skirt, made up by the too much length on the hair. Close, but no cupie doll. Come to think of it, Rebecca, I think you just nailed why I really like this outfit! It's young-feeling, yet absolutely appropriate and gives a very obvious nod to Scotland. She's stunning. It's great that Kate returns to staples like those boots. I'm the same myself. Pieces/accessories I love, I keep wearing because they work. What the point in buying a new black suede boot for the sake of it?? I love the simplicity of the clothes she wears. Oh, good point. And it would lighten up a time when the athmosphere on blogs can get rather whiny/heavy. Charlotte, I would also like to learn more about Katherine favorite designers and their background. It appears that Katherine reasearches the designers not just on style and fit, but also on designers background as well. Its like there has to be a purpose for her to wear a designer other then the fabric and style itself. I have read that she was not into clothes , so I am assuming that she has handle this issue with an artistic eye. I know her background is in art history. I would like to know your take on this matter, fashion vs art. How has this November Mustique trip become fact? The only place I have seen it reported was the DM and their track record on reporting things about the Cambridges is trash. The quality/believability of DM articles depends a lot on the author - some articles are clearly eh, but Rebecca English is trustworthy, as is Katie Nicholl, the author of the DM report about the November Mustique trip. Really good point Maggie and a good reminder. Like any field, some very hard working and talented people are employed at less than prestigious media outlets... just as some of the more respected outlets don't always have the best journalists. She looks fabulous & polished! Love the kilt skirt, a nod to Scotland. Also, I'm digging how she's wearing her fringe....sort of retro, Farrah Fawcett-ish. I'm a fan of those classic boots....however they do look a bit off here (being completely, ridiculously nitpicky here)....perhaps it's the bunching around the ankles? Aren't they usually more "taut"? Thanks for all your efforts, Charlotte!! I do love these boots, but I agree she has worn them many times. It does look a bit chilly and she's wearing her gloves outside. I'd be cold in a dress, even if it is a coat dress. Perhaps she'll find a new favorite tall boot soon! Kate looked beautiful today. Loved the color, and the entire outfit was perfect. The Daily Mail has a great video of them. Kate looks sensational, and very animated. What another great cause they are highlighting today, and I thought it was charming that they spent the night there. It must hold such special memories for them. Charlotte, you did a spectacular job this week, congratulations. Look forward to more next week on our very special Duchess and Duke. I really like it. Nice and modern look and great color. However, is coat meant to be hanging open on the bottom so much? Is that purposeful to show off the skirt underneath? Just find it a bit distracting, but love Christopher Kane. Thanks for the quick posting on this appearance, Charlotte! Hi, I am from Germany and I really like this blog. I am able to understand the most but I have a question does bespoke coat or dress mean it was made only for the duchess by the Designer and its not for sale? Thank you in advance. To add to Rebecca's answer, 'bespoke' is British English and 'custom made' is American English. I learned the word 'bespoke' a few years ago while reading about royal fashions. Sometimes we do have to learn parts of our mutual language from each other! The opposite of bespoke is "off the peg", although this is not used as much, now people buy on the Internet as much as they do in shops. The U.S. equivalent is "off the rack." I am not sure we have an American equivalent of "high street." I learned that phrase right here. I love that they are focusing their attention on mental health, especially in the younger generation. I think William and Kate are doing a wonderful job on bringing much needed attention to issues that are sadly so prevalent. I loved seeing their pictures with the school children. So cute! It seems to have been a wonderful day for William and Kate! 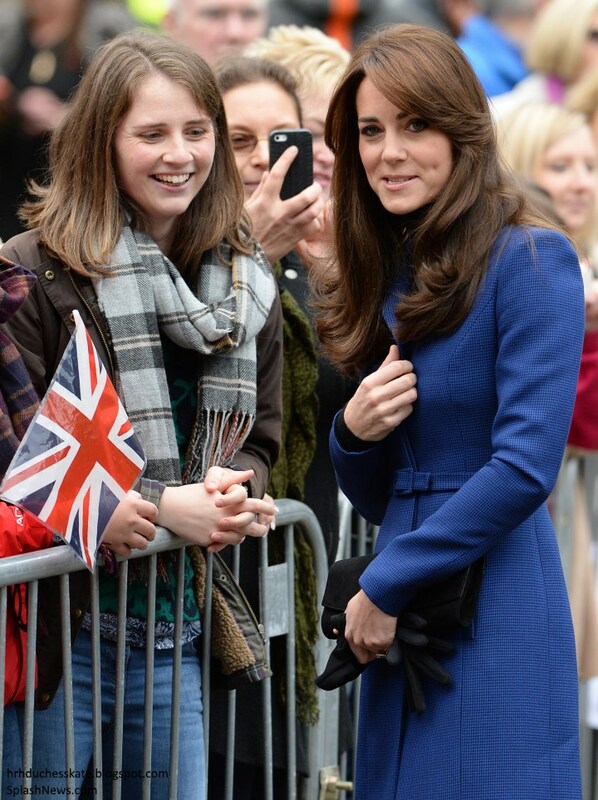 Charlotte, the shots your posted of Kate are fabulous. She looks lovely! I'm looking forward to next weeks engagements! Happy weekend to you Charlotte and all the readers! What a great week of Kate watching! She has really looked lovely. Great style of coat for her today and I love the color. I'm not tired of the boots. They work very well with the outfit. I like the long bangs when styled this way. Very flattering. The Duchess looked very animated today and not tired, in my opinion. I think much of this has to do with lighting. On gray days people complain that she looks tired. She used to be more tanned and wore heavier makeup, but then people complained because she wore too much blush. Now, she's using a lighter touch, but it can make her washed out in photos taken in natural light, especially with a gray cast. She's wearing lipstick here, but it's such a pale shade it looks like nothing in most of the photos. As highlighted by the powder mishaps in the news lately, lighting makes a huge difference. I bet she no one would think she looks tired if they saw her in person. Thanks for the great coverage Charlotte! Can't wait for Monday and Tuesday! She spent the night away from her two babies... no wonder if today she looks not tired! Paola, I wonder if they didn't "play" with this photo. The DM has done it before, IMO. Example...if they want to exaggerate a spray tan. Great outfit, I love that colour! Christopher Kane is still very much considered to be a "young" designer although his career is positively "soaring". Vogue and Elle fashion magazine are covering/interviewing him on a very regular basis. Kate wearing one of his designs is great and will certainly further boost his career. He´s very much a supporter of Scotland where he grew up so it was a nice gesture of the Duchess to wear one of his designs. I´m once again so glad for their support of mental health issues. Keep up the good work! And thank you so much, Charlotte, for all your hard work during this week. I truly, truly enjoyed all the information, the lovely photos plus all the fashion details!!! You really are lucky! they are both amazing people with great heart & soul. I have said it before and I will say it again, some of the royals in history, many of them actually, have had what I will kindly call, some major character flaws. So much so that I stopped researching stuff because it was so sad. SO, on a delightfully and most welcome note, William and Kate, are like a breath of fresh air and I believe they will continue to be. Long day I meant LOVE !!!! LOVE this coat en skirt. Wonderful colour. Any suggestions on repli-kate's? I really liked this outfit. Thanks for your post again Charlotte. She looks great. William looks great. They look great together. They're having a very successful week, aren't they? Scotland seems to make them more relaxed and they were able to showcase their concern for mental health. What's not to like? Maybe they also had a very productive meeting at KP with the media. Can't wait to see some new frocks next week! I absolutely love these colors on Kate. She looks timelessly classic and well put together. The length of the coat is brilliant and the tiny belt accentuates her beautiful frame perfectly. The only thing that seemed to be a little off was that the upper button was more exposed than a proper fit .... talk about being picky ;) . The boots and accessories were perfection, as was her day makeup. Still not loving the hair, but trust me, it's worlds better than my own lol! Oh, well done! I was dying to see that skirt! Loved seeing them at the wheel--great shot. I updated the post with a couple of photos of Kate's outfit without the coat. It was a beautiful ensemble. That last picture is really nice shot of the kilt. Thanks again for getting some more of those. I was thrilled that she actually took off her jacket for once so it is nice to get a better impression of what's underneath. Thanks for being so supportive of your readers and for the great job you do with each and every post. Wow, another great appearance and I love this outfit! The kilt is such a great touch. I love everything about this look. She has really been fabulous this week. I hope she continues to build on that momentum. The coat does not fit her properly as you and others have noticed. It appears that the fitting measurements are off a bit. It's a pity because this is a very nice column coat with a nice face-framing collar. I LOVE the kilt!! This is her color, and I love that we've seen new pieces recently. Looks like a fun day! The way she hides her belly lately... I bet she's pregnant! I think the Queen does and I think she is called the lady-in-waiting. Just guessing. I don't know who she is though. William used to have Jamie Pinkerton in that position? for him, Just a guess. Don't know who that would be now. I love the coat. I love the skirt. But I'm the same age as Kate and I honestly haven't worn a pair of knee high boots like that with an outfit like that in the last ten years! Time for an update. I thought we'd seen the last of them! Oh I see a cute short skirt and knee high boots all the time were I live. All ages from teenage girls to women in their fifties. Heeled boots and equestrian style but also the bootie very high heel. Do not see as much of the over the knee style but once in a while will see it around town. Lol, I'm about 20 years older than Kate and I still wear skater skirts, tights and tall boots in the winter, it's like wearing my pj's to work,so comfy! If fresh and modern is open toed ankle boots in the dead of winter, I'll pass and stick with tried and true. I love boots -- all kinds. Except open toed ankle boots. In winter. With no hose. Yes I saw someone wearing them today. I shivered for her. I love this look! This is a classic Kate piece and blue is a lovely color on her. The skirt/kilt is a great touch too- I think she puts a lot of thought into the pieces she wears to locations/specific events. What did they spend time in Dundee doing while at uni? What is there to do in Dundee? Just curious. Kate, you looked lovely today and handled yourself with grace, as you always do. Keep your light shining. Kate's parents must be so incredibly proud of Kate and, hopefully, happy for her (it is a HUGE role to fill). I hope THEY are coping healthfully with the whole situation. They acquired HUGE roles to fill just by association. the one at the State Banquet. To answer about her, that beautiful lady is..... her maiden name was Rose Hanbury. She is in her mid-twenties, and was a former model. She married the 7th Marquess of Cholmondeley, David, and several months later gave birth to twins. The couple live in Houghton Hall in Norfolk, while Rose's mother-in-law, Lavinia, lives in the ancestral Cholmondeley Castle (built 1801, but the land has been the ancestral homeland of the Cholmondeley family since the 12th century). Rose's husband, David, is an Eton graduate and 25 years her senior. I don't know if she was pregnant at the banquet or who designed that beautiful gown, but I will endeavor to find out. I have a feeling we will be hearing more about the Cholmondeley family as time goes by. Charlotte, I hope this is not too off topic. I have a feeling their twins might be part of George and Charlotte's play circle at some point, and more so, if Rose was again pregnant at the banquet. They live in Norfolk, and Rose was a "commoner", like Kate, before her marriage. So there are links. Thank you so much for all the info! I was wondering who she was and felt she had to be someone important seeing her chat with David Cameron and her seating placement at the dining table. She is very beautiful and I absolutely loved her attire at the banquet. After reading your post I googled the name and have read several articles about Rose and the history of the Cholmondeley family. Very interesting! I would love to see Houghton Hall. It looks so majestic! It will be fun to see if Alexander and Oliver their twins run in the same circles as Prince George and Princess Charlotte, even if they are a bit older. It really looked like she was expecting from the video footage, but I can't seem to find anymore info on that. My pleasure. :) Fun, this English history, yeh? David Rocksavage, 55, (why he is called Rocksavage and not the family name of Cholmondeley, I don't know. I think I would have stayed with the latter.). He is the 7th Marquess of Cholmondeley and The Great Lord Chamberlain (plus other titles too complicated to easily post). They live at Houghton Hall (4,500 acre estate) like I said and it is in Norfolk. They are W/K's neighbors. The twins turned out to be boys born in 2009. They are Alexander and Oliver. George will be close to these boys in age and may attend Eton when they are there.? Charlotte may definitely have a crush on them at some point.? I tried to find out more about Rose's gown but have only found pictures of her in cute, youthful outfits, oh, and with Tony Blair's arms around she and her sister while both bikini-clad. (It was just a photo op.). She and David attended the Royal Wedding and her outfit was gorgeous, I think. Thank you so much for sharing this info. The Marchioness has become incredibly popular since the banquet. Lots of chatter about her since. I think I just read somewhere where her father attended Eton also and now works as their web designer. Her mother has aristocratic heritage, I think, also, but I don't recall the details. "Rose's husband", as he is now known (despite his many other titles), haha, is a direct descendent of Britain's first prime minister. I don't think she is currently pregnant, although it did look that way at times in the video. I do not want to offend, but I truly think the gown would have looked even more beautiful if she had worn a better foundation. She needed to either wear a bra or a better bra if she had one on, That would have been stellar. I am just guessing, but I think her husband was the man on the left as you look at the two men who walked right in front of the Queen on the way into the banquet. I've received a number of email enquiring about the Marchioness of Cholmondeley, formerly model and socialite Rose Hanbury. Following a closer look at her exquisite gown, I believe she wore the Temperley London Angeli Dress. It is a beautiful dress. She really looked lovely. I liked her tiara too. Speaking of lovely, I saw someone else last night who looked absolutely fabulous and really did a great job of tailoring her gown to the event. Helen Mirren in Tokyo. She looked wonderful, and proof positive that you can be fabulous at any age. New security man with Kate? I don't remember seeing him before. Someone asked who assists the Queen. She has a group of rotating ladies in waiting, drawn from the nobility, who travel with her and assist with correspondence. Kate decided on a secretary/personal assistant instead. I very much like Kate's outfit, except for the short, squared off belt tab. It should be longer and rounded or pointed, I think, speaking of nitpicking! I do like the boots, and I think they are intended to 'scrunch' around the ankles. Good to Kate in wool coat, boots, and gloves when the weather warrants. Now we have the gown AND some information on her tiara, thanks to the poster here earlier. Thank you both. From what I am finding out about Rose, she most likely had alot to choose from tiara and bling wise as her husband is also a Rothschid AND Sasson (Eastern Rothschild). One of the ancestral Cholmondeley/Sasson ladies was wearing a huge tiara in one photo I found just in my scant research. Kate looks great - I love this outfit, although I think the skirt's length makes her look very school-girlish without her coat on, and a slightly longer skirt would make her look more sophisticated/professional. But I don't think it's inappropriate or bad-looking, just don't like the image it projects. Her hair looks great too, although I still think it's weighing her down/making her look older. I find it interesting that so many of Kate's engagements have lately been with William. I understand that mental health is an initiative that they both want to focus on - and I applaud them for that because it certainly needs attention and support. But I wonder then if Kate will have an area to focus on that is her own, and not in conjunction with William. I know her role is technically supposed to be supportive of her husband, but I don't think that excludes the possibility of her own niche to focus on. But right now it seems as though she has nothing, and that disappoints me. It's not the 1800s - she should be able to have her own area of focus (like most of the royal women do). And it seems like most of her recent engagements really protect her from having to do much at them. Either they have limited media, or William comes with her, which makes it unnecessary for her to say things, etc. 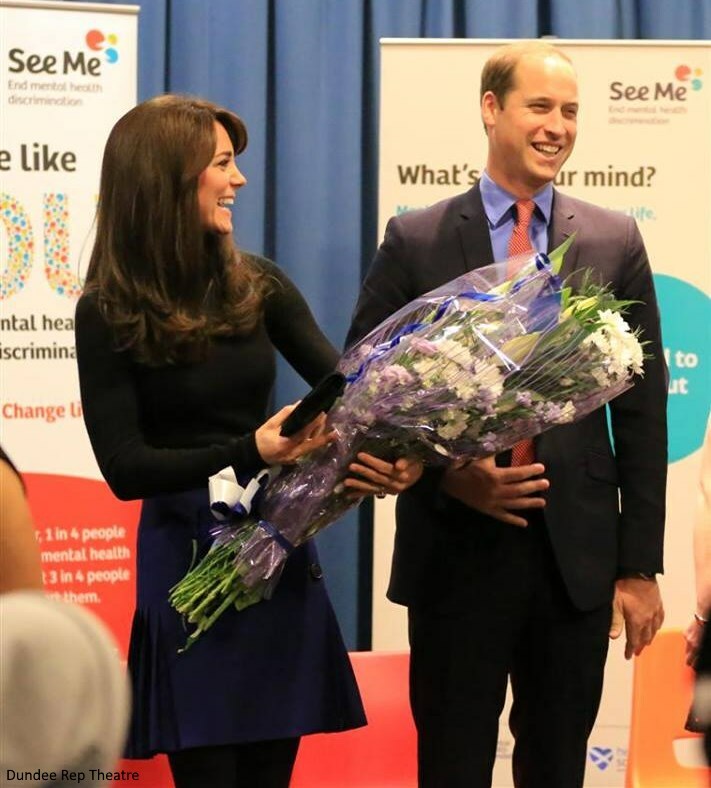 Most of the quotes from the last few mental health engagements are from William; all I've seen from Kate are different variations of "your work is fantastic," which is nice, but not really something people can write about or use to bring more attention to the cause. She's looked great recently, and I'm sure the state banquet was a huge undertaking and very nerve-wracking, but I'm not really seeing any evolution or maturity or growing from the appearances she was doing in 2012. Kate has several charities that do not involved William. And again you really are putting down Kateby your last sentence of your statement. I love the length of her skirt. Kilts are hard to wear, shorter is often better for women:):) Her Kilt also appears to not be as pleated as many, which for many women is more flattering. I would love a bespoke kilt with a big pin and my families plaids. Maggie, I would not expect the Queen to show up with a skirt this length, but given Kate's age and combined with the black hose, I see nothing wrong with it. I believe the Children's Hospice thing is hers alone. Wonderful post! Long live Charlotte and Kate! I have a question that many of you may consider silly, but it is not obvious to me and I'm sorry for that. Why do you say Kate is wearing a kilt instead of a skirt? I thought kilts were worn by Scottish men, not women. So, what's the difference between a kilt and a skirt? I'm sorry, but I'm very confused. Didn't mean to offend anyone either. I would be very thankful if someone could explain it to me. You don't have to be nervous asking about kilts. Kate wore what is called a kilt skirt. It is a skirt with pleats, like the pleats on a men's kilt. Hope that helps. A Scottish poster on another board confirmed the rule that kilts are worn by men. She said such a garment worn by a woman is called a kilt skirt. Glad to know that, since I own one. Kate's skirt, if you look closely, does have the flat front and pleats around the side and back, starting at the hips, that are the mark of a kilt. It is also quite short. I haven't seen the left side, so I don't know whether hers is open and fastened with buckles or a kilt pin. I also don't know whether kilts are always in tartan, but since this is a skirt, it imitates a kilt without being exactly the same. In any case, it was a very nice gesture by Kate to wear it and to let it be visible when she was indoors. Can someone please point me to a link with photos of the "lady in the ice blue dress, Rose"? I've looked through Charlotte's blog about the state dinner, as well as the Daily Mail and Google, and don't see any photos of this person. Would someone kindly direct me to photos of who's being referenced? Thank you! I love the blue on Kate and love the coat and the use of a Scottish designer - think it's not quite professional to wear such a short skirt but will yield to the approval of others. I was thinking what an important engagment this is. Just yesterday a young mum with depression left her baby safely in its pushchair and threw herself in front of a train - such a loss especially for her child when help might have made her feel less worthless. I hope very much William and Kate's active involvemnt with mental health will encourage people to get help - something so difficult to do - and will bring to light the many charities out there to help people. Hi Julia, I've been waiting for you to pop in. I responded to your comment in the last post but it isn't there so thought I would catch up with you here. I do get what you said about the blue lace Erdem working better as a day dress but I like the D&G for this event. Maybe if the length were shorter and it were opaque except for the sleeves people would be less inclined to consider it cocktail only attire. she has so much fun putting together her outfits and posting them. Good information, Rose’s husband has an attractive male appeal. They look like a good match. You will find you tube link under Charlotte’s blog. I think they are talking about the lady seated next to the vice PM (?) to the left of William /not immediately next to him, but four people down on the next table/angular. There is also another lady in similar color dress with a tiara pictured on the hallway to the ballroom. The one seated has some old world charm and calm about her/also beautiful. The other one has a modern face, disposition and is just cute. Lovely look. Lovely post. Thank you Charlotte. about the lady in the Ice blue gown, I said she had a link to Kate in that they were both "commoners". Neither one of them is a "commoner", Rose, perhaps less than Kate. Rose's father, Tim Hanbury, is an heir to an established brewing company. He and his wife raised Rose and her sister, Miranda, at Wembury House, an estate in Devon that Tim now has listed for sale. Miranda married an older man, the Earl of Durham and they have a young daughter. The girls have had an aristocratic upbringing. Rose's mother has a clothing line called Marosa, named after her two girls and she design tents under that label also. of Houghton Hall, the home of the lady in the Ice blue gown, at HoughtonHall.com. It is hosted by her husband, no less, and truly has to be seen to be believed. The house was built by the first prime minister of Britain and the house, the grounds and decor are essentially and mostly the same as they were then. How often does that happen??? Incredible. Oh, and it is a 9,000+ acre, not 4,500, acre working estate. Thankfully this all has remained intact and perfectly kept throughout the centuries, sans a collection of masterpieces that were sold at one point to Russia's Catherine the Great to help keep Houghton Hall intact. "Rose's husband", as he is now humorously becoming known, (funny because he has a "pedigree" about a mile long and almost as many titles), is in the process of re-acquiring those masterpieces. This video is definitely worth a look. It is incredible actually. The daily mail posted the following today. All the European royal wives in those pictures have made an amazing transformation. 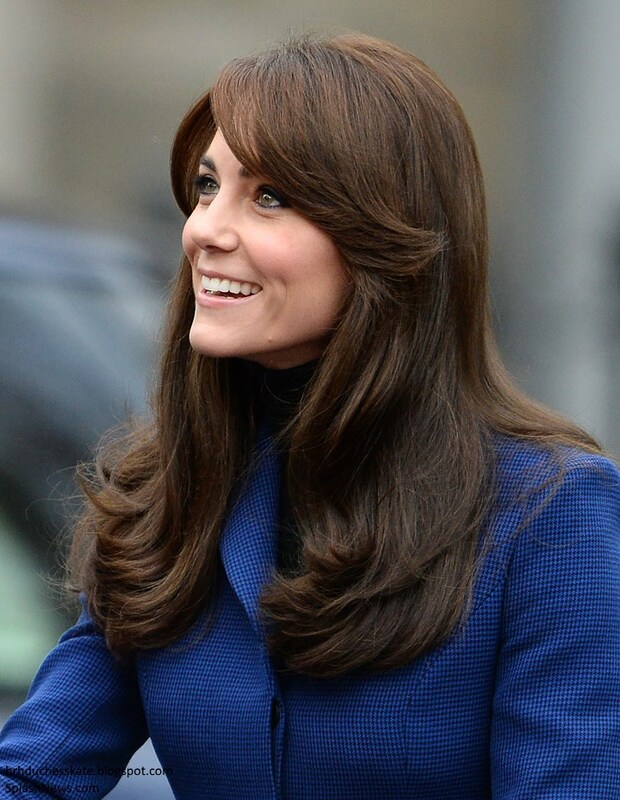 Kate looked more authentic, comfortable, natural, pretty and less stressed before. She seems the least transformed of all. In a way, she had also maintained her authentic self, which had been naturally favorable and beautiful. Indeed she could have been less stressed minus media scrutiny, living for the standard of the monarchy's rules, having to meet a certain expectation as a royal concert, being judged as how she will raise the future king, and being active in engagements. Love conquered all, and what makes W&C special is their love story with in their history, circumstances and background.